Northbound Do You Procrastinate? Don’t Put Off Reading This Article! Do You Procrastinate? Don’t Put Off Reading This Article! 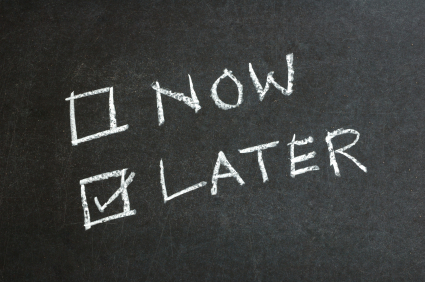 Urgency versus Importance: The first step in overcoming procrastination is to understand that by definition, urgent activities are done before non-urgent. On the surface, this seems to make sense until you take into account the additional factor of importance. In Northbound’s “Goal Aligned Time™” program, we train people on how to place every activity in their personal and business life on a quadrant with these two variables before they decide what to put on their plan. Important tasks are often not urgent and so get pushed off the agenda. Unfortunately these are also frequently “growth” activities such as prospecting and skills development on the career side and on the personal side, might be things such as exercise and building stronger relationships. Have the discipline to schedule these activities so they get done and start saying “No” to low value, urgent activities that are screaming for your attention. The 15 Minute Strategy: Psychologist David Burns recommends simply making a promise with yourself that you will give some task you’ve been putting off just 15 minutes of effort. His point is that we often become overwhelmed by the sheer size of a task and talk ourselves out of it. We might tell ourselves, “It’s going to take soooo long” or “It’s too big to do now. I’ll leave it until I can really focus on it”. Instead, talk back and say, “OK, I’ll just give it 15 minutes and then I can stop”. How hard can 15 minutes of anything be? Once you get started, you will have broken that psychological barrier. Most often, you’ll find that it’s not nearly as hard as you thought it was going to be and you’ll either keep going or not fear it so much next time. Think of the End Result: Instead of thinking of how difficult the process may be to accomplish something, think rather on the end result and all the great things that it will mean to you. Turn thoughts of “I hate cold calling. It’s not much fun” into, “If I make 2 hours of calls, I’ll probably book one meeting. I usually close one out of two meetings so I’m 50% towards a sale if I make some calls!” Once your brain clearly connects the doing of a task with major benefits, you’ll be unstoppable!